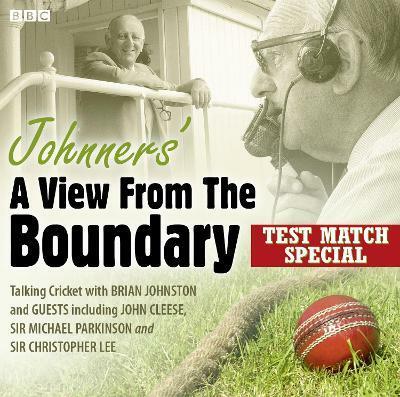 John Cleese, Christopher Lee and Michael Parkinson share their passion for cricket with the great broadcaster, Brian Johnston. During the lunch interval on the Saturday of every Test in England, BBC Radio's `Test Match Special' used to invite a well-known guest into the commentary box for a chat with Brian Johnston about themselves and their passion for cricket. Some turned out to be able cricketers, but they all had stories to tell about matches they had seen and cricketers they had met. Barry Johnston - Brian Johnston's son - has selected five chats from the series `A View from the Boundary', beginning in 1980 with the playwright Ben Travers, and his vivid recollections of W.G. Grace and other characters from the golden age of cricket. He is followed by Michael Charlton, the political broadcaster and former cricket commentator, who covered the great Australia v West Indies tied Test in 1960, and John Cleese, a lifelong Somerset supporter, who tells some funny stories about `Monty Python' and `Fawlty Towers'. Hollywood film star Sir Christopher Lee recalls watching the legendary Jack Hobbs and Don Bradman, and Sir Michael Parkinson talks about opening the batting at Barnsley with Dickie Bird and how he nearly played for Hampshire. Publisher's note: This recording was taken from part of the cassette release of `A View from the Boundary'. 1 CD. 1 hr 15 mins approx. Barry Johnston is the eldest son of legendary cricketer Brian Johnston. He was educated at Eton before becoming a songwriter for Apple Publishing, and in 1969 he joined the vocal harmony group Design. He sang with them for the next eight years (under his stage name, Barry Alexander) and appeared on over 50 TV shows in the 1970s, as well as writing several of their hit singles and many album tracks. After the band split up, Barry continued writing and, for two years, was manager of The New Seekers. He left the music business in 1983 to start a career in broadcasting, first on Californian breakfast show KLOA-AM and later with Radio Sussex and Radio 5. In 2006, he established Barn Productions, and has since produced over 100 audiobooks, including the award-winning Johnners at the Beeb and An Evening with Johnners. He has also edited several books and is the author of two biographies, Round Mr Horne: The Life of Kenneth Horne and Johnners: The Life of Brian.